I love the smell in my house when a curry has been cooking all day long. The aromas are fragrant and so inviting. 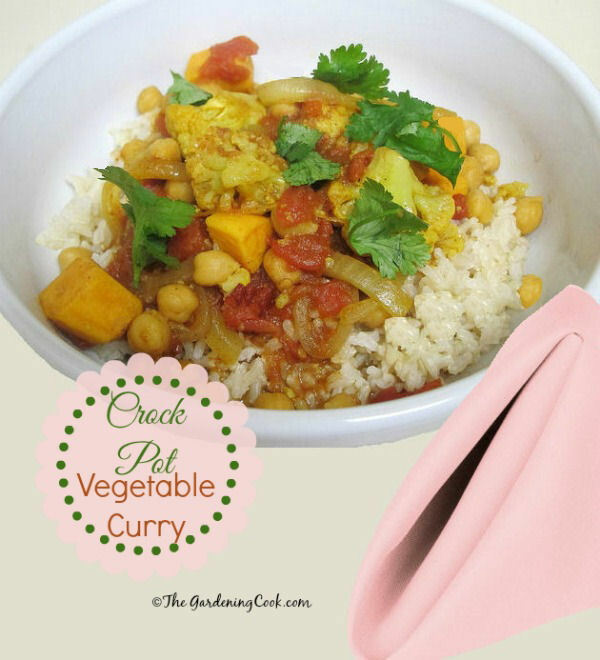 This recipe for crock pot vegetable curry is a remake of one that recently tried on my meat eating. The recipe is vegan, vegetarian, gluten free and fat free and one of my favorite meatless crock pot recipes. 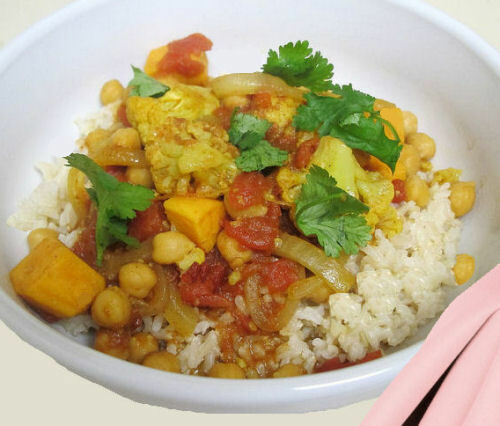 Fill the House with the Aroma of this Crock Pot Vegetable Curry. But in spite of that, Richard just loved the taste of this dish. It is full of flavor and so healthy and wholesome. Even for those of you who are not curry fans, this dish is worth a try. It is rich and yet quite mild with a very savory taste. One of the beauties of the recipe is that it is made in the crock pot. Add the spinach at the end and let it wilt just a little and you will be amazed at the flavor. Rich and delicious. You won’t miss the meat at all. Hope on over to Facebook to see my healthy cooking page too. You can add any vegetables that you have on hand. The more the merrier! I made it the other night with cauliflower and brussel sprouts and it was delicious. If you like curries cooked in the slow cooker, check out this crock pot chicken curry. Combine all ingredients, except baby spinach, cilantro and sour cream, in a crock-pot. Stir to mix well. Cook on low for 6-8 hours or high for 3-5 hours. When soup is done cooking, stir in baby spinach and let sit for 5 minutes.